Yesterday, T.I. released his ninth studio album Paperwork and made a return to The World’s Most Dangerous Morning Show, The Breakfast Club. During the conversation, he revealed flying back from Africa after performing in front of 50,000 people being one of his largest solo concerts ever. His Trap Muzik genre was brought up whether T.I. could still make those records for the streets, but realized he wanted to evolve in comparison to saying previously mentioned things within material from 10 years ago – which he cited is why Entertainment Weekly gave him a perfect review for the new album. Aside from having to fly back to Atlanta to film for Marvel Comics upcoming film Ant-Man, he also discussed turning down a role for previously to start in DC Comics Green Lantern. 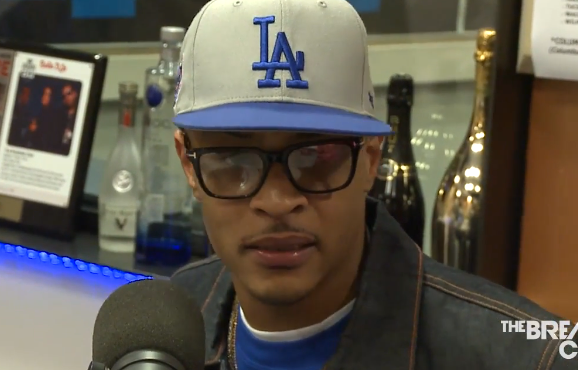 Charlamagne Tha God soon mentioned no albums have went platinum the entire year, which T.I.P. was more focused on releasing a body of work listenable past the 4th season. Watch more of the interview above discussing his upcoming 10th studio album entitled The Return, “About The Money (Remix)” with Jeezy & Lil’ Wayne, as well as a Streets Is Watching-like mini movie series he plans to release for Paperwork. Tagged with: Interviews Slider T.I.